A set of electronic switch, the voltage display of input and output, high current UBEC in one, which can simplify your airborne equipment. 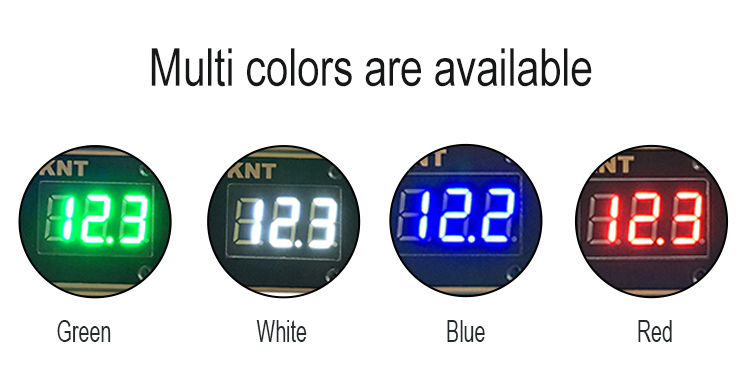 The three led segment display real-time input and output voltage value, which can help you to know the condition of power supply at once. Output voltage 4.8-9.6V stepless adjustable, which adapt to a variety of high and low voltage servo and receiver. 15A large current output ( MAX: 20A ), which can provided sufficient working current for the steering gear. Working voltage 6-13V, which can be directly power supplied by lithium, nickel-metal hydride and nickel cadmium, A123 battery. It can once again the power-up and continue to maintain a normal output voltage at accident power-off. 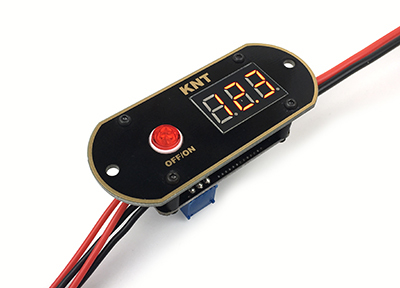 Press the red button for 2 seconds (button lights turn on, led segment display input voltage value for 3 seconds until button lights turning to flashing at this moment led segment display output voltage for 3 seconds after returning button light on and the led segment display input voltage value. Press the red button for 2 seconds to shutdown system. In the working state, short press the red button to switch the display channel of the output and input voltage value. If you want to adjust the output voltage value, short press the red button to switch to display the output voltage value, use a screwdriver to adjust the potentiometer at the end of the step-down converter, counterclockwise rotation can turn down the output voltage value, the clockwise rotation can turn up of the output voltage value ( notice: disconnect the receiver or the electric device to the converter before adjust the voltage). Ventilation should be pay attention in the condition of large current. Please use the high-quality battery to avoid loss-of-control.